Expert craftsmanship and elegance meet in the Chene Wood engineered wood flooring range, creating a harmonious collection that offers a gorgeous décor solution to all types of environment and interior design arrangements. If you want to create your dream home, just take a look at our selection of Chêne Wood products and read about the key features of the collection, listed below. Whether you are looking for a classic oak floor or want a more stunning walnut product that will catch the attention of your guests immediately, here you will find exactly what you need. These floors are not only made to the highest standards of quality, they are also available at a reasonable price, offering you excellent value. Your property makeover projects start here, at BestatFlooring. The engineered wood flooring collection from Chêne Wood is made using premium quality materials, carefully selected and brought together to offer you the best flooring solutions for your home. 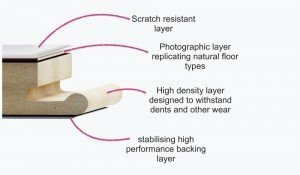 Made with a multi-ply construction, all the floors from this range have a 14mm thickness and a 3mm wear layer. You can choose from oak and walnut – either way the hardwood layer is strong enough to keep up with your busy lifestyle and to maintain its natural beauty for a very long time. Renovating a small room in the attic or want to revamp the floors in your home with stylish and quality products? Whether large or small, narrow or open plan, you can transform any area in your home quickly with one of the floors from Chêne Wood’s collection. Available with widths of 125mm, 150mm and 180mm, the planks are also made with various lengths, of 400mm and up to 1600mm, helping you find the perfect floor for any home improvement project. Chêne Wood provide a range of finishes to enhance not only the look of their floors, but to improve their durability and performance. The brushed and oiled finish brings out the delicate grain profile of the solid wood layer, whilst protecting the floor for longer than an unfinished product. The white oiled finish lends the floor an elegant and modern look, making the floor ideal for a vast range of applications, from minimalist flats to traditional settings. If you want a floor that is easy to clean and to maintain, the three lacquer finishes are perfect. Whether you want a simple lacquered finish, a satin lacquer or the more advanced UV lacquer that will also protect the wear layer from staining, you’ll find a floor to suit your needs in this collection. There is something for every property style and personal preference in the Chêne Wood range of engineered wood flooring. From light grey and neutral tones that will match a modern home perfectly, to the rustic and warm brown oak or the stunning walnut floor, with all its organic patterns that look like a painting. Want to make a statement? Choose the opulent and simply spectacular Golden Hand Scraped floor, and bring a bit of luxury in your home. The gold foil look, with its bright tones and delicate grain patterns will surely be admired by your guests and will make your home truly stand out.